Discussion in 'Maiden Chat' started by cnesbit, Oct 24, 2018. Bob Angelo has a new book out. I just ordered from Amazon. I am curious to see what his take on the early years is like. 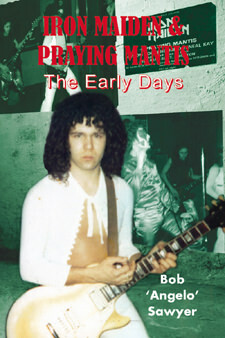 "Bob Sawyer — one time guitarist with both Iron Maiden & Praying Mantis tells his story covering the previously unchartered depths of the early days of both bands with all the gigs recalled from Bob’s own archive, including previously unpublished photos. Bob also picked up with Iron Maiden again when Praying Mantis toured as the support act on Maiden’s first headlining tour. Bob kept diaries, which now published in this book, give a great behind the scenes look at the formative days of not just these bands but of the enduring heavy metal movement as well. " Forostar and Magnus like this. Is he the guy who apparently wrote Sanctuary? Yeah. He claims to have written it and that Stave Harris bought the rights from him when he left the band. I think Late 1976 - April 1977? I am very curious to see if there is anything worthwhile in this book hat sheds some more light on this phase of Maiden. Is sanctuary listed as written by Harris in the booklet of the album? I am very curious to see if there is anything worthwhile in this book hat sheds some more light on this phase of Maiden. covering the previously unchartered depths of the early days of both bands with all the gigs recalled from Bob’s own archive, including previously unpublished photos. Such info is rare, especially from this particular phase in Maiden. Thanks cnesbit! I'd like to get this. Anyone that has the book, think is worth while? I enjoyed it. The first third of the book is full of first hand accounts of early Maiden gigs. There is also a gear run down for each member and a listing of gigs from his time in the band. The last 2/3rds is more in depth and focuses on his time in Praying Mantis. (Although this section also has many stories involving Maiden from when Praying Mantis toured with them). It's an enjoyable, quick read and definitely worth your time in my opinion. Thanks for the answe @cnesbit might order it after all.